New video dropped showcasing ZShock's iced out Mogul bezel for the G-Shock. Sit back and watch the video, then go cop one. 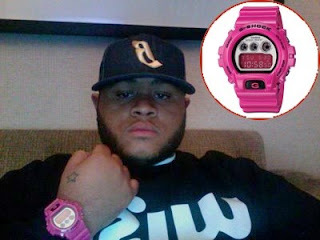 Aaron Reid, son of L.A. Reid (Island Def Jam), is seen here rockin his pink G-Shock. AR is a known fan of the G-Shock and a true afficianado of fly gear. Check out his Blog at http://www.theaaronreidexperience.com/. This is a cat who can wear what he wants and G-Shock is an accessory in his wardrobe. The ZShock iced out Mogul Grande Bezel for the Casio G-Shock has dropped. This iced out diamond bezel for the Casio G-Shock features just over 7 carats and is available in different price points and different precious metals like Silver, 14K white or yellow gold as well as precious Platinum. ZShock's expertise is evident in the perfect fit of the bezel. It fit's like a factory original. The watch comes with both a Casio warranty as well as a Zshock warranty for the bezel. At the time of this post, the Mogul Series of ZShock bezels will be available in four standard versions, but customization is ZShock's forte` and an unlimited array of options are available to the customer. So, go ahead and ZShock your lifestyle today by copping your own iced out diamond G-Shock from ZShock. 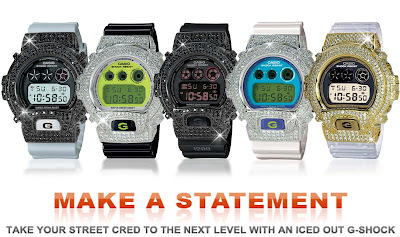 ZShock, the company known for iced out Diamond G-Shocks, is happy to announce the launch of the official ZShock Blog. The ZShock Blog will be a comprehensive representation of the ZShock lifestyle. The Zshock Blog will report on everything that we feel is hip and happening for our ZShock lifestylers. In the coming months ZShock plans to announce many new aspects to our Brand and we will use the official ZShock Blog as a jump off to highlight these announcements. Be sure to subscribe to the ZShock Blog so you are notified right away of all our Blog posts. ZShock is known for the art of taking the Casio G-shock watches to a whole new level with Diamonds or Ziamonds set in precious metals like Silver, Gold and Platinum. The ZShock Blog will be a place you can turn to to see what's hot, as well as special product announcements and promotions. Bookmark us or subscribe and stay tuned find out what we will ZShock next.